5th Annual event coming up fast! You can still pre-register for the race or walk, just remember that you will need to add a t-shirt to your checkout if you’d like one. All pre-registered participants (that means up until the day of the event) will receive a free water bottle! We are looking forward to celebrating River’s 5th birthday with everyone. Donations of auction and raffle prizes are arriving daily! 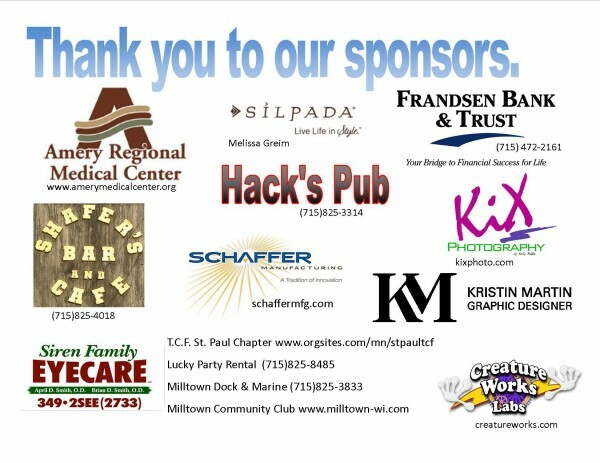 Thank you to all of our donors and supporters. Thank you for helping us make this the best year yet, words cannot express our appreciation! Here is just a start to the items that will be on our live auction (or raffle) in just 3 weeks! Don’t miss your chance at some of these amazing items! Updates can be found here. 2 passes to Superior Public Museums – visit either the Fairlawn Mansion or the S.S. Meteor. 1 night stay at Comfort Suites in a deluxe lake view king or double queen suite (not valid June-August). 4 Water Park tickets at Mt. Olympus + 4 tickets to Top Secret in Wisconsin Dells. Free hotel stay and $20 off any food purchase at St. Croix Casino in Turtle Lake. Family pass to ride round trip to Marine on St. Croix from Minnesota Transportation Museums. River’s Rally is very excited to sponsor Race for Carrots! This fundraiser is for Kari Milberg who was involved in a tragic car accident this winter. Kari suffered a severe brain injury and extreme physical trauma. Kari is a graduate of Unity High School and this event is being coordinated by her classmates to help with costs she faces in her continued process of healing. The race is named Race for Carrots because Kari’s nickname is Carrots! Her recovery is truly a miracle and we invite you to join us in this celebration of Kari. The event includes a 5K Race and 1 Mile walk along with family fun! Ben (co-founder of River’s Rally) was a classmate of Kari’s and it only seemed fitting that we were able to help with this event. All proceeds from this event will be given to Kari to help offset ongoing medical expenses. See details on the event below! Date and place: Saturday, June 14, 2014 at Unity School. Little Carrots Kid’s Race following adult race. T-shirts are available to purchase for pick-up at the event. Pre-registration available until May 31st. Route will be available soon, please check back for updates. First of all, we want to say thank you to everyone that donated funds for us to match donations to the Chad M. Hansen Memorial Fund. We are able to donate $730 because of your generosity, in partnership with Art Anderson Realty. This was our first adventure in this kind of partnership and matching funds so we are very glad it was so successful! With the remaining funds Art Anderson and River’s Rally have decided to purchase this statue to be placed in Milltown in memory of Chad and in honor of the excellent Volunteer Fire Department that we have. Watch for details regarding location as spring gets closer. We express our deepest condolences to the Hansen family during this difficult time as they grieve a wonderful person, Chad Hansen. For those of you who may not have had the pleasure of knowing Chad, he was an employee of the Village of Milltown and a member of the Volunteer Fire Department and served as Deputy Chief most recently. As you can imagine, this loss is a tremendously difficult for the entire community. 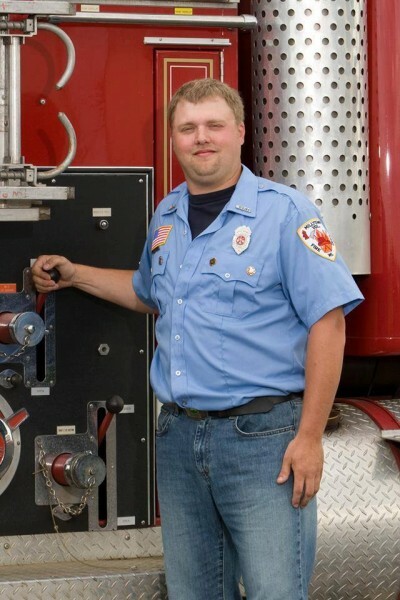 There has been a memorial fund set up in his memory and River’s Rally with help from Art Anderson Realty would like to match funds donated up to $1,000. You may donate online via PayPal (which can be done with or without a PayPal account) or by mailing a donation to River’s Rally – PO Box 341 Milltown, WI 54858. We will collect donations until Monday, March 31st. 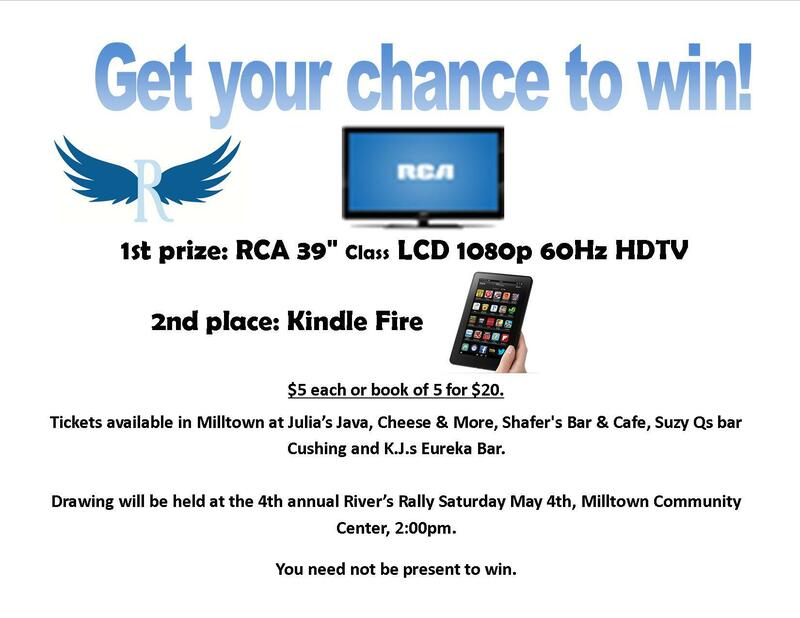 River’s Rally is thrilled to help a young member of the Milltown Community with his first annual event supporting the Milltown Public Library Building Project. We had a fantastic day despite the weather and raised over $7,500! Thank you to all of the participants, sponsors, donors and volunteers. We could not do it without you. The 10K Race winners: Jeff Howe, Justin Fultz, and Brian Smith. The 5K Race winners: Steve Schaffer, Marta Kirkhorn and Melisa Rodriguez. Pictures of the day will be available as soon as we receive them from the photographer, Kix Photo. Thank you all again!! The remembrance project for River’s Rally 2013 is underway. 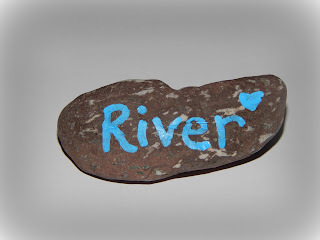 This year we will personalize a rock and display them at our event. For $10US we will write your child’s name on a rock and then give it to you (if you cannot attend the event add $4.95 for shipping). Shipping will be combined if purchasing more than one rock. All proceeds benefit River’s Rally. Please note that all stones are unique, no two will look alike. This photograph is just one example. We also recommend that if you will be placing rock outside to seal it beforehand. They will not arrive weatherproofed.